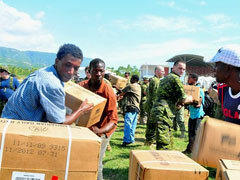 Honda has announced a donation of more than $300’000 to Red Cross for the victims of Haitian Earthquake. In addition, Honda has also supplied with moveable generators, water pumps and more products to help during the recovery struggles in Haiti. The donation has been a combined resource collecting from all the other family Honda companies in North America, which are mostly in manufacturing, financial affairs, R&D, and Sales throughout USA, Canada and Mexico, the total number of employees are numbered more than 31’000 associates. Honda wants to help in the situation where Haitians are in an awful conditions, and facing the terrible time to recover, and even in finding their own family members. Honda has been working with Red Cross from quite a long and have been quite helpful, still they are intend to move forward with same quest and standing side by side to assist in recovering from this natural devastating event. I’m elated to learn of the contributions made by Honda($300,000.00) and people like Jay-Z & Beyonce ($500,000.00) for this cause. I’m sure there are others that are donating that I havn’t heard about. Question is.. What will P-Diddy do? He is a self proclaimed “Stunna” who just paid over $364,000.00 for a Maybach (Gift for a kid) who makes his money off the people. C-mon Diddy keep the people believing in you. It’s time to show up and do ‘the right thing’ it won’t hurt you.